The exceptional beauty of the secluded Seychelles islands off the east coast of Africa once inspired the tale of the Garden of Eden. 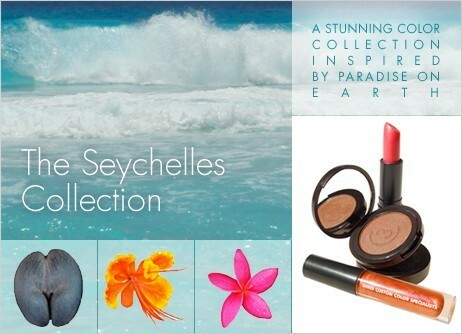 On a recent trip, one of our Founders, Chad Hayduk, was so moved by the legendary allure of the Seychelles that he was inspired to create this luscious collection. Each irresistibly fresh shade celebrates the natural beauty and vibrant colors of some of the rarest species of flora on earth. Coco De Mer Eye Shadow ($22.50) – A rich, medium brown with a playful dose of green shimmer for added dimension, inspired by the round, suggestively-shaped nut that can be found only in the prehistoric Vallee De Mai forest of the Seychelles. Use wet as a subtle liner or dry to create a sultry smokiness around the eye. Frangipani Sheer Lipstick ($21.50) – Vivid fuchsia with gold sparkle that can be worn soft or bold. The award-winning sheer lipstick formula delivers buildable coverage and rich moisture in a smooth, balm-like texture. Peacock Flower Lip Gloss ($21.50) – A pinky, peach shade with light-catching violet opalescence, inspired by the rare and dazzling Peacock Flower. Our moist and creamy lip gloss formulation is a makeup artist favorite – smooth and shiny, but never sticky. Experience the colors of the beautiful Seychelles without the 18 hour flight! Get all three shades in this value priced set. A travel bargain!! A rich, medium brown with a playful dose of green shimmer for added dimension, inspired by the round, suggestively-shaped nut that can be found only in the prehistoric Vallee De Mai forest of the Seychelles. Vivid fuchsia with gold sparkle that can be worn soft or bold. The award-winning sheer lipstick formula delivers buildable coverage and rich moisture in a smooth, balm-like texture. A pinky, peach shade with light-catching violet opalescence, inspired by the rare and dazzling Peacock Flower. Our moist and creamy lip gloss formulation is a makeup artist favorite – smooth and shiny, but never sticky.